Want a miracle product for any and all hair types, well this is it! 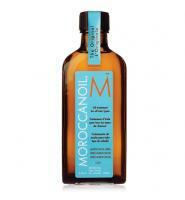 I am obsessed with my Moroccan oil! A little bit goes such a long way and it does not weigh down my fine hair. Lots of my girlfriends and family members use it too an they all love it and they have a wide range of hair from light and fine to thick and curly. The key is to not use too much and to experiment with how it works best for your hair. For example, I put a little bigger then a dime size in my hair wet I get out of the shower and then blow dry. My friend though likes to use a little bit of it on her dry hair before styling and finally my aunt uses a very small amount after she is completely done doing her hair to give it great shine. You have to play around with it a bit but once you find what works best for you, you will be hooked! Bottom Line: Buy it and watch your hair transform!